Effectively monitoring economic and social rights has long been a challenge for human rights advocates and activists, thanks largely to the complexities inherent in analyzing multifaceted principles such as 'progressive realization' and 'maximum available resources'. 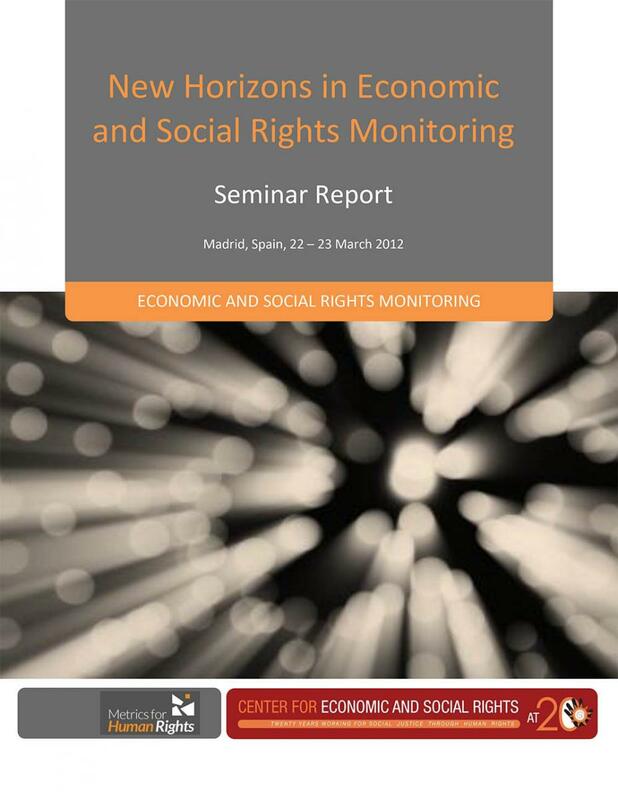 The Center for Economic and Social Rights has brought together the expertise of over 40 leading figures in overcoming these obstacles in its new report 'New Horizons in Economic and Social Rights Monitoring'. The report draws together the knowledge and experience shared at a seminar of the same name organized by CESR and Metrics for Human Rights in Development in Madrid last year. Offering a unique compilation of experiences from all corners of the globe, the report shows how monitoring can be used to strengthen the enforcement of economic and social rights, foster policy change, and improve people's daily lives. Comprising insights from a broad spectrum of experts, the report breaks down the disciplinary silos that have so often impeded mutual learning about economic and social rights monitoring. Broadly following the structure of the seminar itself, the report summarizes the presentations made and provides commentary on the main issues that emerged from the discussions. It begins with a stock-take of progress in the field to date, exploring how different bodies, including the United Nations human rights mechanisms, national courts, and national and international NGOs, have expanded the scope of their analysis to address systemic ESCR violations and how, in response, different analytical approaches, including more quantitative approaches, are needed. It then delves into particular monitoring methods that have been developed in recent years in more detail. Questions on the use of human rights indicators, indices and benchmarks are addressed, along with budget analysis and impact assessment methodologies. CESR's OPERA Framework - a simple but comprehensive four-step process for assessing fulfillment of economic and social rights - is also explained. Finally, it reflects on how these tools and techniques might best be deployed to address some of the key accountability gaps of the day, in the context of deepening economic recession, fiscal austerity and failing development commitments. Given that rights-based policy monitoring requires a comprehensive, multidimensional approach that integrates a variety of tools and techniques to provide compelling evidence of rights violations, this timely report offers important insights for rights advocates and activists everywhere. It is CESR's hope that this report will facilitate more effective monitoring by economic and social rights advocates, and will in turn contribute to the policy changes needed to meaningfully improve people's lives. CESR will continue to foster regular dialogue on the issues addressed at the seminar through a new Working Group on Monitoring ESCR, which it co-convenes with the International Network for Economic, Social and Cultural Rights (ESCR-Net) with guidance from a core group organizations and individuals. The working group responds to a long-standing demand within the Network for more regular forums for exchange, so that activists and practitioners can expand the range of tools at their disposal for ESCR monitoring and effective advocacy. If you are interested in participating in the ESCR-Net Working Group on Monitoring, you can join its listserv by emailing escr-monitoring-subscribe@yahoogroups.com or contacting acorkery@cesr.org.